Renowned watercolourist Kate Osborne brings a new collection of work to 35 North Contemporary Fine Art this April. Focusing on the joys of allotment life, her vibrant, abstract watercolours capture the ever changing landscape of this oasis in the heart of Brighton. Kate was born in Uganda, schooled in Hertfordshire and studied textile design at Northbrook College in Worthing. She worked as a textile designer for many years both in the UK and USA, four years in Los Angeles and a year in New Mexico, where she also painted wildlife and botanical subjects exhibiting in a Santa Fe gallery. On returning to England she took up residence in Brighton and earned a living as an illustrator; clients included London Transport, Sainsburys and several publishers. She later returned to painting and has since developed her trademark watercolour style, in addition to etchings, oil painting and digital art. Her interests and subject matter are mainly the natural world (which stemmed from her solitary wanderings in the Yorkshire countryside as a child) and garden landscapes. 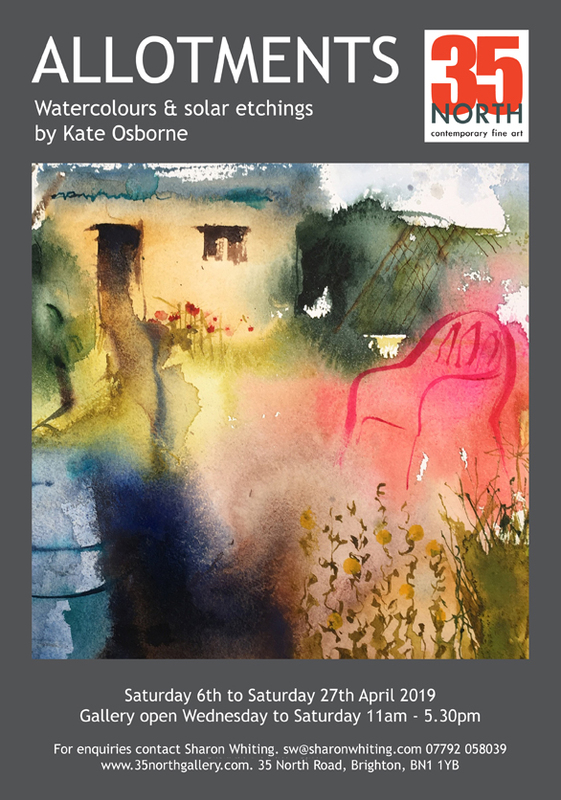 Kate works freely in watercolour from life, both en-plein-air and studio based, with the minimum of compositional drawing, capturing the transitory nature of the subject matter with a rich spontaneity. Kate has exhibited for many years in her open house during the Brighton Festival, at the Affordable Art Fair Battersea and Hampstead and in galleries including: 35 North; Spa Galleries Tunbridge Wells; the Royal Institute of Painters in Watercolour and the Society of Wildlife Artists at the Mall Galleries London.